Slide 1: Title slide. Much of this material has been derived from Pierotti 2010. Indigenous Knowledge, Ecology, and Evolutionary Biology. Routledge. Ch 2. 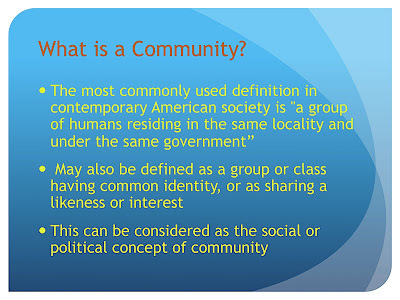 Slide 2: Most people think of human communities, which invokes social or political concepts, when they hear this word. This is a legacy from Greek Philosophy, where ethical and political obligations are confined to humans. 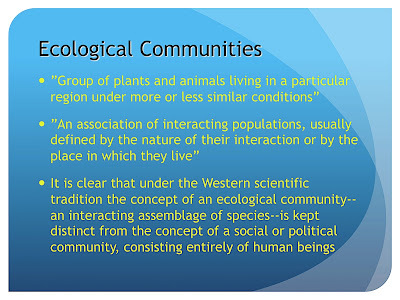 Slide 3: In ecological terms communities consist of all life forms, and even include geographical features such as mountains or rivers. 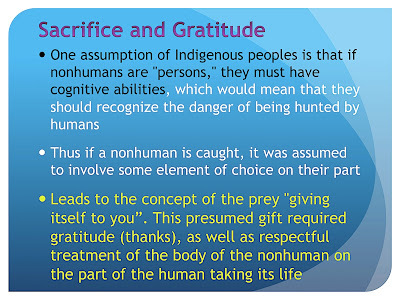 This concept is the one employed by Indigenous people who follow traditional ways. This is a major reason why Indigenous people have a scientific tradition. 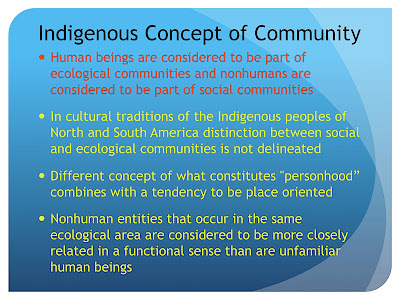 Slide 4: This is similar to the concept of politics and ethics in the Western (Aristotelian) perspective, however Indigenous concepts of ethics incorporate other life forms, which makes Indigenous concepts much closer to the ecological concept of community than to the Western social concept of community. 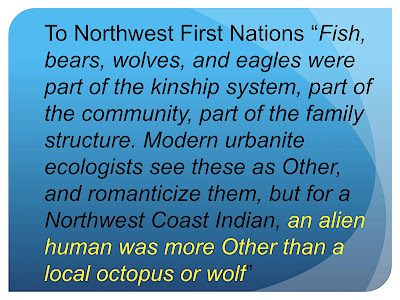 This quote can be used as an introduction to the concept of “The Other” and also to what it means to be connected or related to the place where you live and all of its inhabitants, both human and non-human. Slide 6: Best current evidence is that Indigenous peoples and their ancestors have been in the Americas for 15000-20000 ybp. This is important information because it means several things. First, humans could have been in the Americas as much as 10,000 years before the period described as “Pleistocene extinction”. This means that it is unlikely that humans caused this extinction. This concept of a human blitzkrieg, which wiped out many species of large mammals, is another myth, along with the idea that humans entered North America only through the Bering Land Bridge, that have been pushed by Western Science, even though there is not much evidence to support the arguments. If Indigenous stories go back this far it means that these may be some of the oldest stories on earth and that the oral tradition has some strengths that written accounts or histories simply cannot match. 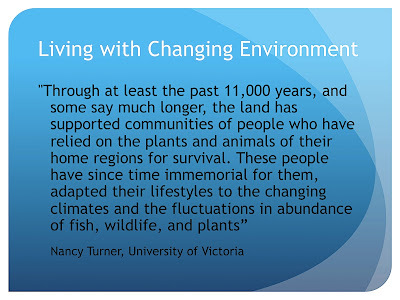 Slide 7: This quote from Nancy Turner’s book The Earth’s Blanket reinforces the point made in the previous slide, that humans have been in North America for so long that all of their cultures evolved in that land and its places. 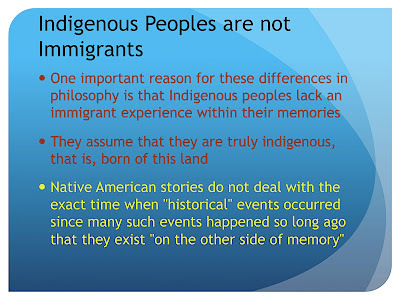 This is what it means to be Indigenous, and this renders any statements about immigrants meaningless. This also raises the issue of what it means for humans to have “always lived in North America” or to “have always been here”. If a culture arose in a place and all of its memories and stories are related to a place, this is equivalent to having always been here, because no culture on the planet, except maybe Aboriginal people in Australia, have stories that are older. Because of the way in which writing has dominated Western thinking means that people from this tradition have lost their ancient stories or regard them as legends, whereas cultures with an oral tradition have not lost these stories. 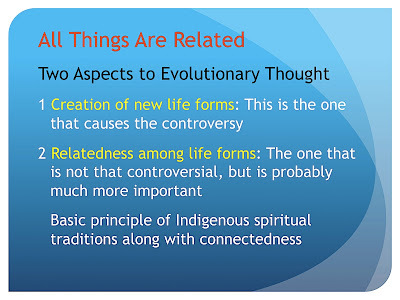 Slide 8: The idea of connection is an ancient one, and it has been maintained in traditional societies as a spiritual principle. It is also a central concept of Western Ecological thinking and can be seen in ideas as disparate as James Lovelock’s idea of Gaia and Chaos Theory. 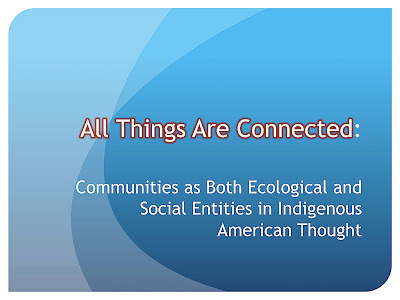 The important contribution of Indigenous thought is the idea that humans must always consider connections and that this connection is at the essence of what it means to be human. 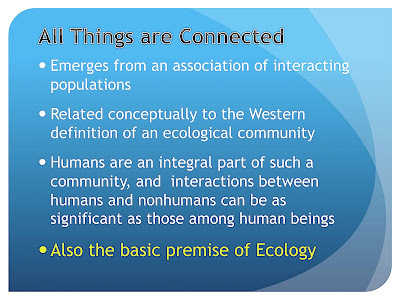 Slide 9: The idea that humans are part of ecosystems is important. It lies at the heart of the issue of the Problem of Conservation Refugees, which is dealt with in more detail in our course on Environmental Justice. 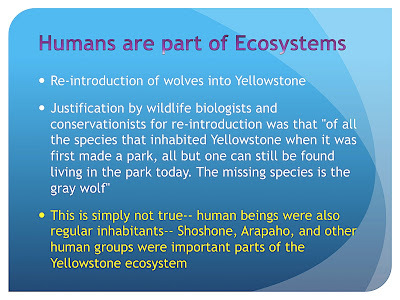 The crucial issue is that conservationists of European ancestry feel that because humans like themselves cause environmental destruction that all humans should be removed from all refuges and national parks. This ignores the fact that in many parts of the world Indigenous peoples lived as part of these systems for millennia without causing damage that was recognizable by Europeans as damage. As one example, most conservationists argue that the Amazon Rain Forest is “virgin” and never touched by humans. In fact Amazonia was full of people living at reasonable high densities before the invasion by Europeans (see article by Charles Mann or Mann’s Book 1491, published in 2005 by Alfred Knopf, New York, NY). Gomez-Pompa, A., and A. Kaus. 1992. 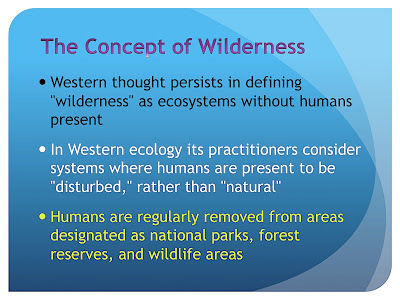 Taming the wilderness myth. BioScience 42: 271-279. 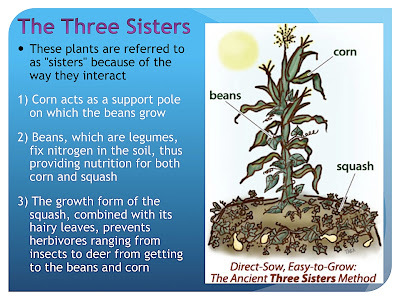 Slide 14: This idea of relatedness is formally codified through membership in a clan or clans, that create a set of rules and taboos that govern your interaction with your fellow clan members, both human and nonhuman and it is often forbidden to eat your nonhuman clan relatives. 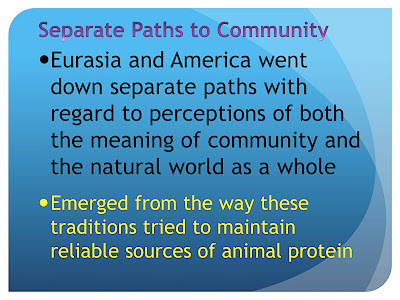 This is one reason that relatively few tribes have clans that are based on important food organisms, e.g. 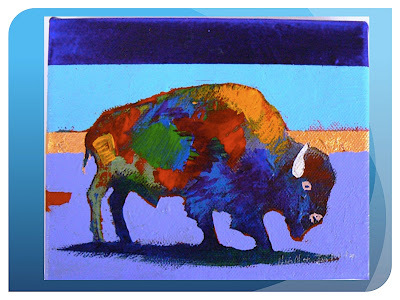 there are almost no bison clans and there are no salmon clans in the Pacific Northwest. 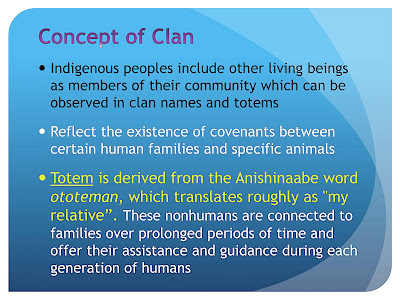 The term Totem is a word from the Anishinaabeg language that means relative. Slide 15: Western scientists spend a lot of time arguing about what separates humans from the rest of nature, especially animals. 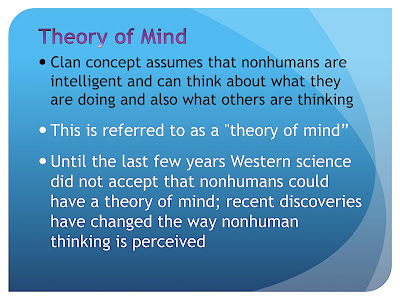 In contrast Indigenous concepts always assumed that animals were intelligent and equivalent to humans in many ways, including having concepts of self and mind. Only recently, i.e. in this last decade, have Western scientists started recognizing such mental abilities in nonhumans. Pennisi, E. 2006. Social animals prove their smarts. 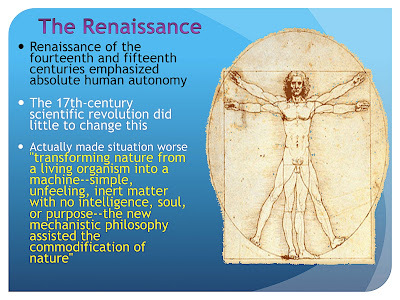 Science 312: 1734-1738. 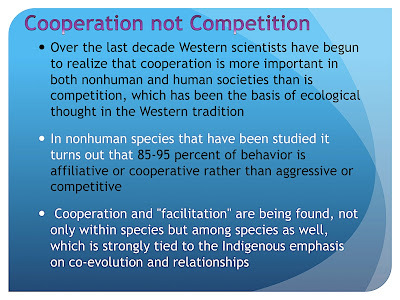 Slide 16: Western science has long held the idea that competition drives ecosystems and relationships between and within species. Again in contrast, the major concept in much of Indigenous thought is cooperation. 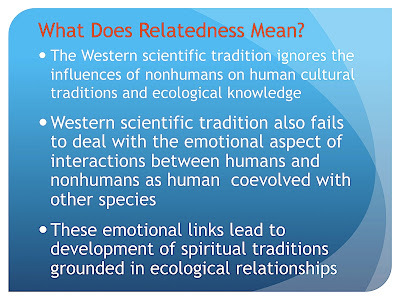 It is interesting that only in the last 10-15 years have some western scientists begun to argue that cooperation is also more important in relationships within and between species, and some of these individuals acknowledge the Indigenous traditions as the source of such ideas. R. Barash, 2000. Taking Indigenous science seriously. In Biodiversity in Canada: Ecology, ideas, and action, ed. S. A. Bocking, 152-173. Toronto: Broadview Press. M. Bekoff 2002. Minding animals: Awareness, emotions and heart. New York: Oxford University Press. Shouse, B. 2003. Ecology: Conflict over cooperation. Science 299: 644-646. Slide 17: The combination of scientific knowledge and spiritual tradition is important, because one of the major problems facing Western science is its apparent lack of deeper meaning that emerges from its attempts to be “objective”. In fact all human activities are subjective to varying degrees and science involves emotions and caring for organisms, even though the philosophical traditions that emerges from Cartesian dualism tries to keep spirit separate from science. As a consequence Western Science and its “objective nature” have been involved in some horrific activities, including slavery, genocide, eugenics and unacceptable levels of experimentation, and the development and use of nuclear weapons. 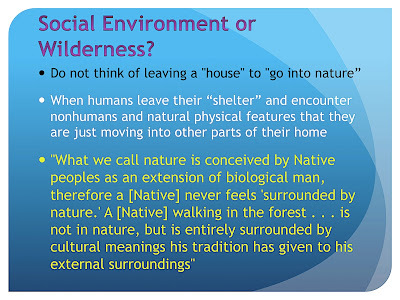 Slide 18: It should never be thought that it was easy for Indigenous peoples to develop these spiritual traditions and to induce people to think of the lives they must take to survive as gifts from nature. 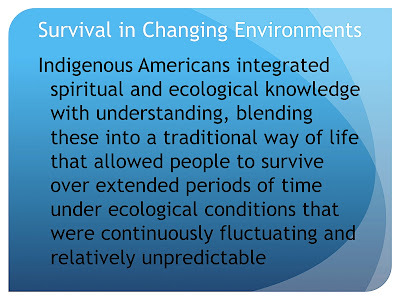 These were survival skills and the traditions evolved so that humans would not harm important sources of food, shelter, etc, and to overcome the natural tendency in all organisms, including humans. 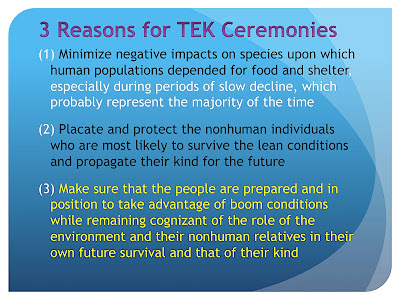 Many ceremonies and rituals were developed to convince nonhumans that humans did not mean them any permanent harm and too show humans that this was the proper way to behave to insure long term survival, i.e. for seven generations. This is different than the profit-driven attitudes of Western management practices. 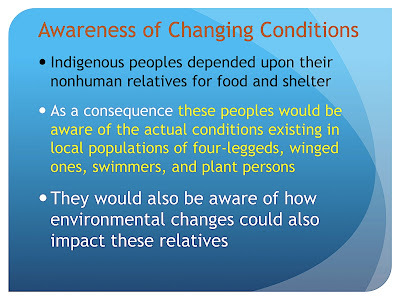 Slide 19: One crucial aspect of Indigenous thinking was that the environment could change and that many of these changes could have negative impacts on survival. To cope with this variability they developed these rituals rather than depending upon the use of pesticides, herds of domestic animals, or large-scale agriculture. 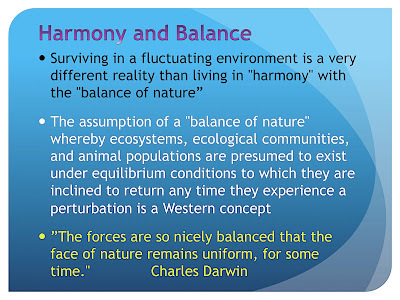 Slide 20: In contrast to Indigenous recognition of a variable environment, Western thinking assumed a balance of nature that was derived from capitalist economic metaphor by assuming that “balance” could always be restored to a system as it returned to a “climax” ecosystem. 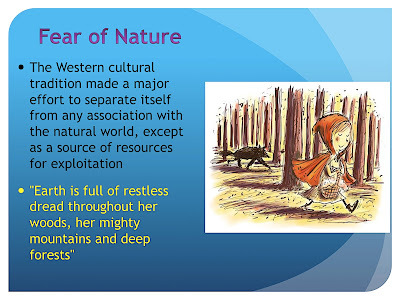 This also links to the idea of “virgin” forests and lands untouched by humans. To accept that Indigenous peoples had managed systems and had a functioning economy that was not based on extraction and destruction would have forced a rethinking of Western economic and political values. 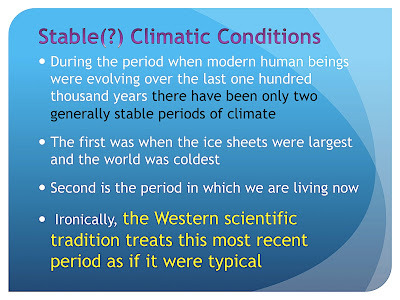 Slide 21: Indigenous people knew that ecosystems and environmental condition were not stable because their ancestors had arrived during the ice age and they had seen the major changes associated with the end of the ice age, major climate change, volcanic eruptions and earthquakes, as part of their experience in North America over the last 15,000-20,000 years. They also were aware of cycles in important food species and in the changes of forests that accompanied the end of the ice age. 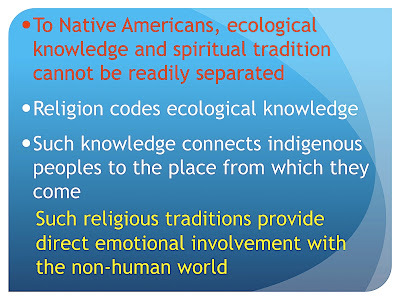 Slide 22: Much of Indigenous spirituality and knowledge about Nature can be seen as ways to reduce risk and manage important resources, by identifying these resources as Relatives. 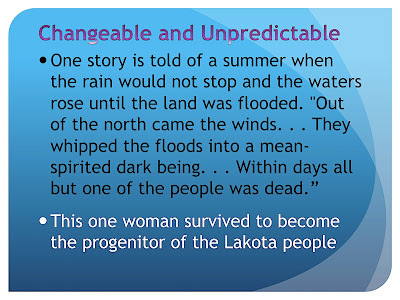 Slide 24: This is a story from a people of the northern plains about their history. Note that this story probably refers to the end of the ice age and its consequences. Source: Marshall, J., III. 2001. The Lakota way. New York: Viking Compass Books. Page 126. Slide 25. 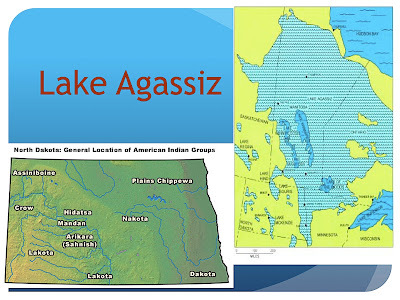 This change in Lake Agassiz would have sent it directly over the lands in which the ancestors of the Lakota lived. The description of the weather in the story reported by Marshall is essentially what we would expect to happen as massive glaciers melted quickly, something that may have happened in as little as a decade (Pearce 2007). It is very likely that what Marshall (2001) refers to as a re-creation story of his people is an account of the end of the Ice Age and its consequences to his ancestors. Source: Pearce, F. 2007. With speed and violence: Why scientists fear tipping points in climate change. Boston: Beacon Press. Page 151. 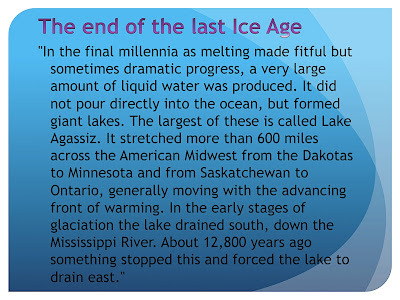 Slide 26: Lake Agassiz, which was the result of melted glaciers at the end of the ice age was one of the largest lakes in the world and may have formed within a few days or weeks. Imagine being people living on land that was flooded by this lake as it formed. 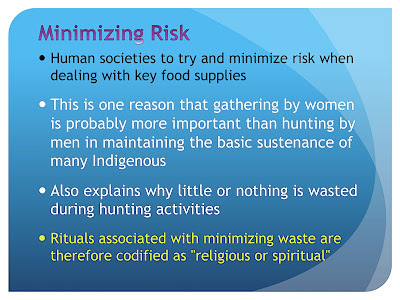 Slide 27: The goal on Indigenous societies was minimizing risk, rather than maximizing harvest or intake. The rituals to placate nature were designed to prevent behavior that would increase risk or do damage to key resources. Western “optimal foraging” models assume that the only goal is to maximize intake. Source: Tanner, A. 1979. Bringing home animals. London: C. Hurst. 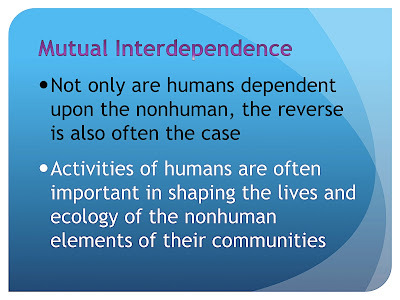 Slide 28: This is the source of the reciprocity between humans and nonhumans. 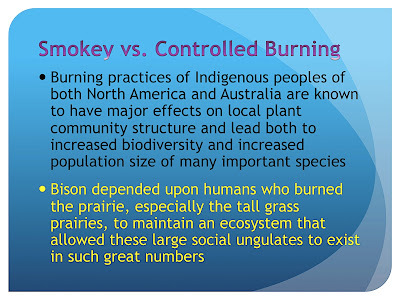 Humans can do things that improve conditions for plants or animals that are important as food sources, such as burning forest understory or prairie to improve grazing. 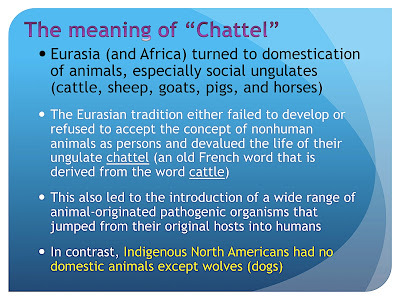 Slide 30: One major difference between Europe and North America is that NA has no real indigenous domestic animals (the only exception is the turkey, which was not domesticated by many tribes). As Europeans (and Africa and Asia) began to keep and raise domestic ungulates (cattle, sheep, goats, pigs, chickens, and at time horses) as reliable sources of protein they developed an attitude of separation from nature that was codified by Descartes and Bacon in the beginnings of science. 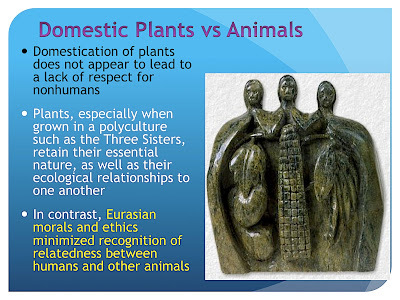 Slide 31: Domestication or living with plants does not seem to have the same philosophical and cultural impact, perhaps because plants maintain something closer to their original nature under domestication, especially polycultures. Epidemic Disease transforms cultures, changing Europe after the Black Death, and allowing the conquest of the Americas, where Indigenous peoples had no immunity to introduced diseases. 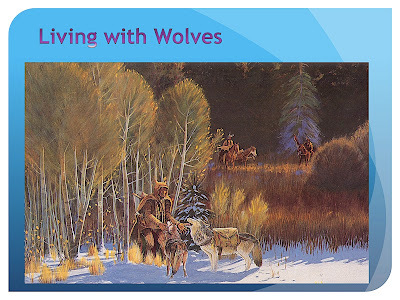 Slide 32: The only domestic mammal in North America was the wolf (dog), which was more of a hunting companion and pack animal than a source of food. Slide 35: The quote ids from Kirkpatrick Sale’s book 1991. The conquest of paradise: Christopher Columbus and the Columbian legacy. New York: Alfred A. Knopf. 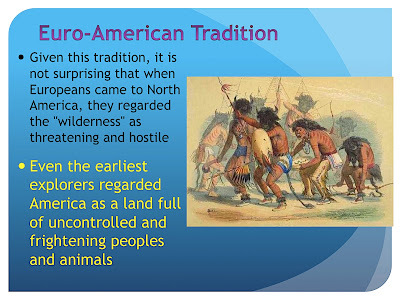 Slide 38: Europeans viewed North America as a “virgin land” inhabited by Savage beings, both human and nonhuman. 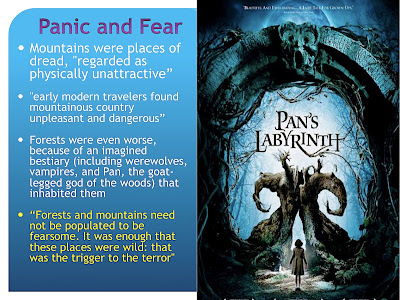 They were particularly upset by the fact that the humans identified with the “beasts”, which to their way of thinking also made the Indigenous people as beasts. They did as much destruction as they could to get America under their control.